The blizzard “Petra” hammered Germany with more snow on Friday, causing countess road accidents, shutting down air traffic and trapping hundreds of people in an icy train. The rail passengers suffered a nightmare scenario on Thursday evening when their trip came to a chilly halt. The regional train between Hamburg and Lübeck stopped cold when it lost power due to snow damage along contact wires. With no heat, light or explanation from train conductors between 4:30 pm and 8:30 pm, passengers reportedly panicked. Several tried to break open windows and escape, while others used emergency exits to venture into the darkness – a major breach of safety because other trains were still running on nearby tracks. Others called the police, who along with local fire fighters drove some 150 passengers to a nearby sports hall from the site near Tremsbüttel. Several passengers were treated for hypothermia. On Friday afternoon national rail provider Deutsche Bahn said passengers on the train would each be compensated €250 for their trouble. The German Weather Service (DWD) warned more snow was likely this weekend after a brief respite on Saturday. Britain will be hit by a seven-day cold snap from the weekend, with snow, frost and gale-force winds set to arrive just as the nation thought winter was finished. The country basked in 20C temperatures at the weekend - the hottest of the year - as big crowds enjoyed the Grand National and FA Cup semi-finals and packed beaches and tourist attractions. But the coldest winter in 31 years has a final sting in the tail. Forecasters warned of 2C nighttime temperatures - low enough for frost - for the rest of this week, with heavy rain at the weekend and then snow through next week in northern England and Scotland. The wintry weather descending on Britain is expected to continue into the weekend, boosting the estimated two million Easter holidaymakers heading for the sun. Forecasters warned that the holiday weekend would be “cold, wet and windy” for most of the country with only Easter Sunday having a good chance of sunshine. The snow that paralysed Scotland and Northern Ireland will continue to fall on higher ground over the next few days. Sleet and hail are expected on lower ground. Dave Elliot, a Met Office forecaster, said that as the area of low pressure from Scandinavia that brought this week’s blizzard conditions to Scotland and Northern Ireland moved away, another area would move eastwards across the country on Friday. Parts of Britain were waking up under several inches of snow today as a flash of winter weather in spring made some areas colder than Moscow. Up to 48,000 homes were without power as blizzards, gale-force winds and torrential rain hit both Scotland and Northern Ireland, knocking down power lines and causing widespread transport havoc. In the worst-hit part of the province, around 300 people - including children on a school bus - had to be rescued from vehicles trapped in snow overnight on the Glenshane Pass near Londonderry. While some parts of the UK were below freezing, temperatures in Moscow reached a mild 13c (55f). BRITAIN will be hit by an Arctic blast today bringing freezing conditions and travel chaos across the country for Easter. Temperatures over Easter will plummet to as low as minus 11C as winter roars back with a vengeance after a brief thaw earlier this month. Much of the country will be colder than Moscow all week with the Met Office issuing severe weather warnings that up to 12ins of snow could fall on higher ground. And forecasters said there would be no escape from the icy grip with a return to conditions which saw the UK suffer its coldest winter for 31 years. It may be British Summer Time but a wintry blast is on the way, forecasters warned today. 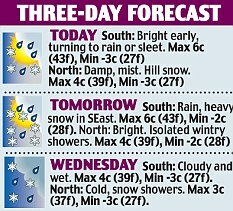 There will be a cold snap on Tuesday and Wednesday, with snow expected on high ground in northern parts of Britain. Julian Mayes, senior forecaster with MeteoGroup, said: 'It's turning very unsettled and we expect a two-day cold snap on Tuesday and Wednesday, which is going to give quite a surprise to many people after the recent mild weather. 'The current charts suggest it's going to be fairly short-lived in the south, with the worst of the cold winds and risk of snow being on the northern hills. 'On Tuesday, we expect to see rain or showers over most of Britain, with strong northerly winds over Scotland turning the rain to snow there in some places. More than 7,000 travellers were stranded overnight in southern France after unseasonal snowfall blocked roads and rail tracks. The worst of France's icy weather had passed by Tuesday afternoon, with only Corsica remaining on high alert for further snowfall. The Mediterranean island lay covered in snow between two and 50 centimetres deep on Tuesday. Weather bureau Météo France predicts snow storms will continue over Corsica until Thursday. It warns of a high risk of avalanches in the island's mountainous regions. 3,000 Corsican households remain without electricity as engineers struggle to reconnect power lines. 10,000 homes were cut off in Monday's storms. More winter chaos is on the way this week with parts of Britain expected to wake to a fresh blanket of snow on Wednesday. The South East is forecast to see the worst of the freezing weather, with up to four inches falling on high ground in Buckinghamshire, Bedfordshire, Sussex and Kent.